Everyone wants a low bounce rate – it’s one of the most popular and telling metrics regarding site popularity and overall health. Bounce rates differ from site to site and page to page, which means a “one size fits all” bounce rate reduction strategy really doesn’t exist. There are, however, several things you can do to decrease your bounce rate by diving into the comprehensive list below. True, lasting bounce rate reduction is often long-term process. It is not “one simple trick” or a single piece of code to add. Meaningful results take time to measure, test, and improve. Visitors didn’t find what they were looking for – because the page was lacking content, organization, or was too complex – so visitors bounce. The site/page isn’t user-friendly – because the site design, flow, or technology got in the way – so visitors bounce. Below we will break down the reasons why visitors bounce into deeper, measurable portions so that we can determine how to improve bounce rate in an impactful way. OK, so visitors are coming to your site and bouncing – let’s see if they are finding what they are looking for first. This is a simple concept, but it’s one that is very complex because it’s open-ended. We have to connect the reason why the visitor came to the page, and what our page is telling them. Easy, right? Scenario: A visitor is looking to purchase a side-by-side refrigerator, starts their search online, and clicks through the search results one by one. They land on a page of “how to fix a side-by-side refrigerator”, immediately know this isn’t a way to purchase a side by side refrigerator, feel disconnected and bounce. They land on a page of traditional freezer-on-top refrigerator models. They immediately know it’s not the correct category, but may dig further to find the correct category if the site is well-organized – but if it’s too complex, they will bounce. They land on a page matching their search intent to purchase a side-by-side refrigerator and find several models, pricing, and information – this is the page that the visitor will spend time on and ultimately purchase from. That was my recent experience attempting to research and buy a refrigerator. Many of the returned looked like a list of products in the search results, but when visited the sites the intent didn’t line up with my intent, so I bounced. Other pages were close to what I wanted, but the sites were terribly designed and I couldn’t find the right category in the navigation, so I bounced. When I found sites with matching products and the site navigation was easy to use, I would stick around and read more. I also ultimately purchased a fridge from one of these sites offline. Visitors will discover and visit your site from a variety of sources – search traffic, social media, emails, referral links and more. The best way to discover intent is to use two tools – the Google Analytics Channel Report, and the Google Search Console (formerly Webmaster Tools). With the Channel Report, see which channels are sending traffic to your high bounce pages. Is referral traffic bounce rate too high? Determine the inbound links and see if they are correct and pointing to the proper pages based on the inbound link and it’s context – if not, then perhaps attempt to update the link by contacting the referring site. If the referrer does have the correct link, does the referring page mention something the current page doesn’t have? If so, address that. Is paid traffic bounce rate too high? Dig into your campaigns to be sure that the ads keywords, the ad copy, and the landing page are using aligned messaging. If you have ads with mismatched messaging (such as a free trial, but no mention of it on the page), visitors will get spooked and leave. For more a more in-depth guide on making pages easier to read, check out my post 7 Tips For Writing For The Web. Many times bloggers and marketers will create unnecessarily long pages – sometimes with nefarious purposes such as keyword stuffing or artificially increasing page length to manipulate SEO – and in the end, good content is buried or obscured. Having clear content, that is broken into logical and bite-sized sections, that each section answer an objective will provide the best way to get to the point. Users are conditioned to search when they want to find something. If visitors can’t search your site, you are instantly handicapping your site usability. Consider adding a site search as top priority, and once it site search is enabled, learn how to track searches by setting up Site Search in Google Analytics. If you do have a site search, is it easy to find? Is it easy and error-free to use? What does the results page look like – are results easy to read and clear? Putting some time into improving the visibility of your site search will prove invaluable for those visitors who think you can help, but they don’t know where to navigate to next. This is a stupid simple test, and one that is VERY revealing. Capture a screen shot of your page, and upload it to http://fivesecondtest.com/ (you will likely need to create an account first). Then, send the page to people who will observe the page for 5 seconds, and then be asked what they remembered. 5 seconds is a good timeframe because that’s about how long visitors will stay on site to determine if they need to dig further in, or if they should bounce and try the next result. Remember, don’t argue with the data, even if you disagree with it – try to understand the intent of the user, and what stood out to them. Many times visitors will land on a page, and be confused by the design or navigation. Having a simple, structured site can reduce bounces. Letting a page have a purpose is important, even if it’s “Read More Articles” or “Comment”. If you, as the site creator, don’t know what the user should do next, how will they ever know? That is how users get sideways on websites. If you decide your page should have a Call To Action or a defined next step in a funnel, be sure it’s clearly defined, obvious, and that the site’s design doesn’t hinder it. Here are 8 Call To Action examples that clearly define the next step for a user. Sometimes visitors will bounce because they are distracted – this means paying attention to things on your site and in particular your high bounce pages that can interfere with visitors using your site. If you link out to external sites, be sure to open that link in a new window by using the target=blank code, just like below. Sometimes a high bounce rate can be because your site has issues being displayed in certain browsers. Internet Explorer is notorious among web developers for breaking things, particularly the older versions. 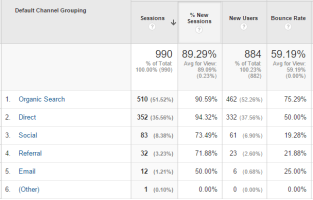 Use the Google Analytics Audience -> Technology report to see if certain browsers have noticeably higher bounces than others. Is your site mobile friendly or responsive? If not, chances are high that bounces for your non-desktop users are higher. 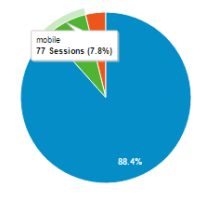 Take a look at your bounce rate in Google Analytics in the Audience -> Mobile report, and observe the desktop, tablet, and mobile segments. If your mobile traffic is significant (over 15%), and your bounce rate is higher than your desktop, it’s time to consider a mobile friendly or responsive site. With mobile users set to outpace desktop users in 2015 and beyond, having a mobile friendly or responsive site ensures your site has a future. Invest in a mobile friendly or responsive site. Got Questions About A High Bounce Rate? If you’ve got questions about any of the tactics above, or have an idea for troubleshooting high bounce rates, I’d love to hear it – sound off in the comments below.